We’ve got so many pearls in the workshop just waiting to be made into something wonderful, and going through them the other day it struck me how different they are, and yet they’re all pearls. A bit like potatoes, really. It took an Irish woman to teach me that not all potatoes are created equal, and now I find that not all pearls are created equal either. I know so little about so much. Did you know, for instance, that only 5% of pearls on the market are salt water pearls and the other 95% are freshwater pearls? In fact wild saltwater pearls are incredibly rare – and therefore incredibly expensive – and are found in only about 1/10,000 oysters. The three kinds of saltwater pearls are Akoya, Tahitian, and South Sea, and the reason they’re so different is because they all grow in different oysters. Black lipped oysters make those amazing black pearls with the deep purple sheen to them; yellow lipped oysters make the ‘gold’ pearls. and so on. Salt water pearls produce one pearlat a time. According to National Geographic, even with cultivation practises the annual world production of diamonds is ten times greater than the annual harvest of Australian South Sea pearls. Rare indeed. And then there are the freshwater pearls…. 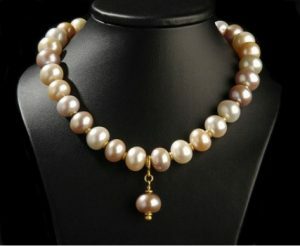 did you know that freshwater pearls actually grow in mussels and not in oysters? China produces the overwhelming majority of the pearls for the world market – you probably knew that bit – and a freshwater mussel will typically produce 30 to 50 pearls at a time. Sometimes we’re able to get really magnificent mabé pearls which I’m great at selling but really know nothing about, so I went and had a dig about and it turns out that a mabé pearl is actually a blister pearl; this means it grows on the inside of a shell rather than in a mollusk itself. 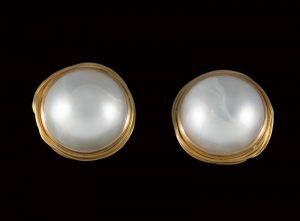 This produces a pearl with a flat back – so great for setting in 22ct gold! So when you’re shopping for pearls, don’t bother asking whether they’re ‘cultured pearls’ (as I did…) because pretty well all pearls are cultured, and if you’re looking at pearls that cost the same a small house in the Cotswolds, you don’t need to ask the question because they’re probably some of the very rare, and exquisitely beautiful, wild salt water pearls. Oh, and by the way, did you know all pearl oysters are born male and transform into females at around 3 years of age? As I said, I know so little about so much.